FOA ofrece libros de texto y guía en línea en español! 4D - The Future Of Training and Tech Work? Want To Buy A Contracting Company? OTDR Problems Just Won't Go Away! How Do You Clean A Really Dirty Ruggedized Outdoor Fiber Optic Connector? All books were updated for 2014! While we can't keep track of every FTTH development, we try to visit groups who we think are doing innovative things that can influence others to do something similar. We visited Chattanooga and Clarksville, Tennessee , where the electrical utilities offer Gb FTTH installed along with smart grid systems. Tennessee now has a number of cities which have created their own systems and now they are banding together to share experiences and maybe just do a little pushing toward being allowed to expand their networks. The Tennessee Association of Broadband Providers has a number of members from the industry as well as the local providers with the goal of "uniting our leaders and workforce to discuss projects, infrastructure, business models and future industry outlook." 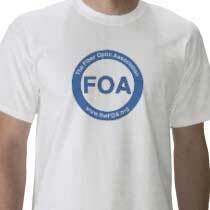 FOA is developing a partnership with the group to promote their cause. FOA recently visited C Spire headquarters in Ridgeland, Mississippi, near Jackson, to talk to Senior VP and technologist Gregg Logan about their program to offer FTTH in Mississippi cities. C Spire began years ago as "Big Creek Telephone Company," an independent telco with 17 central offices and fewer than 20,000 subscribers. They were an early entrant in cellular and have grown rapidly in the cellular area, becoming a major provider with retail stores seemingly everywhere in the region. C Spire has lots of fiber experience, connecting central offices, cellular towers and data centers. They did their first FTTH system in Roxy, MS back in 2005 with 297 customers. But last year, C Spire showed you did not need to be a Google to offer FTTH. 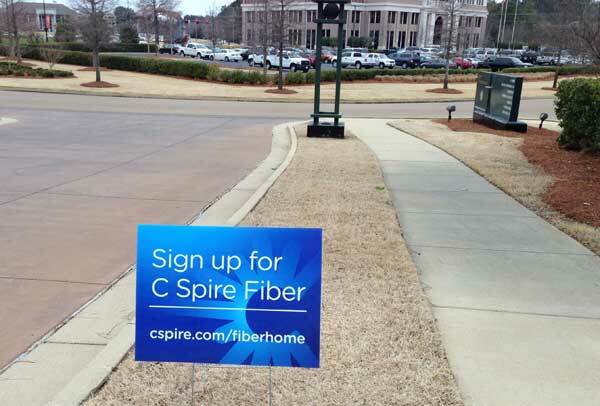 They invited Mississippi cities to submit applications to become C Spire fiber cities and 33 cities responded. Of these, 9 finalists were chosen, more than C Spire had planned but the applications and enthusiasm were too great to ignore. There have been several failures of these kinds of "grass roots" programs to offer broadband, but most were started long before Internet access became as popular as it is now - most consumers today consider it a necessity - and before the option for high speed would open up opportunities for OTT (over the top Internet downloads of entertainment without the restrictions of a typical CATV system.) Perhaps the climate has changed. *For our international readers not familiar with American slang, "grass roots" means something done at a local level by and for the people who benefit from it. The small South American nation of Columbia is poor and not exactly known for high technology. But the government is planning to provide fiber-optic Internet access to 96 percent of the country's cities and towns. If all goes as planned, soon all Colombians will even have their own storage space in the cloud — a little piece of digital real estate provided by the government. Unlike in the United States, where technology has helped create new divisions between rich and poor, Colombia wants to use the Internet to close the wealth gap. 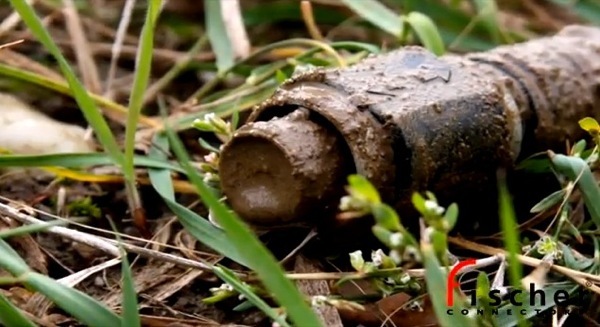 Its program appears to be working, according to Diego Molano, Colombia's minister for information and communications technology. In the last three years, he says, the program has helped lift 2.5 million people out of poverty. But there's still an international digital divide, Molano says, because the majority of the world's apps and services aren't built with poor people in mind. They're built for the rich. "When we connect, for example, a rural school to Internet, when we connect a small school in the middle of the jungle to Internet, those kids in the middle of nowhere have effectively the same opportunity to access the whole of information society — just like any kid in New York, London or Paris." Read the interview with Minister Molano In The Washington Post. April 1 is the traditional date for bad jokes. Remember Google TISP where they said you could flush a fiber optic cable down your toilet to get FTTH? (FOA Newsletter April 2007) Well here are some stories this month that look like candidates for April Fool's jokes, but may not have been intended that way! "The global dietary fiber demand is expected to grow from 96,400 metric ton in 2011 to 216,000 metric ton by 2017, at an estimated CAGR of 14.0% from 2012 to 2017. As of year 2011, North America leads dietary fiber consumption with a share of 36% in terms of value, followed by Europe (31%), and Asia-Pacific (17%). Many of the Asia-Pacific companies are now building up their share in the market with the advent of soluble novel fibers across the globe. Single User Price - US$4650 Corporate User Price - US$7150 Get a Sample copy of this report @ http://www.rnrmarketresearch.com/contacts/request-sample?rname=59997"
Needless to say, we removed it! And what better time than now to recognize one of the women who helped develop fiber optic technology at Bell Labs. Dr. Suzanne R. Nagel, an engineer at AT&T Bell Laboratories in the 1970s, 80s and 90s, working on TAT-8, the first transatlantic submarine fiber optic cable. Nagel was elected President of the IEEE Lasers & Electro-Optics Society, Chairman of the Glass division of the American Ceramics Society, and a Fellow of the Optical Society of America. By the time she retired, she had received two patents and was the first woman to be named an AT&T Bell Laboratories Fellow, the highest technical level of recognition in Bell Labs. Nagel credited her career success to establishing a mentor system, and she set out to use her visibility to help create mentoring opportunities for other women in science, speaking to organizations across the country, serving as on the Board of Directors of the Women in Engineering Program Advocates Network (WEPAN) and moderating sessions at WEPAN’s yearly Women in Engineering conferences. You can read more about Dr. Nagel in Holly Martin's article about her. 65 floors, 650 rooms, 54 wireless APs, triple play in every room, with costs <1/2 a traditional network. The case study was written by Vision Technologies, the contractor. A MUST READ! 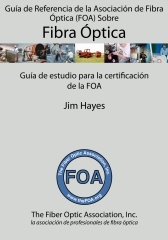 All FOA Guide Books were updated for 2014! 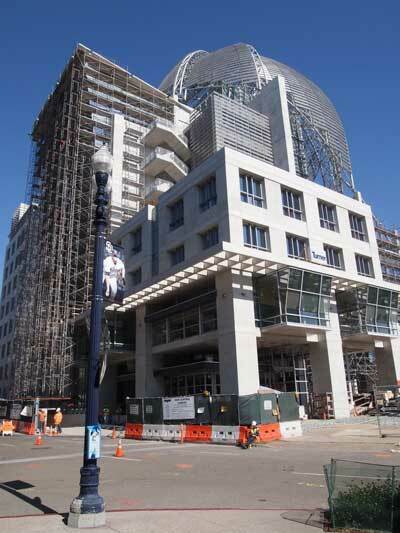 We've covered Google's efforts to enhance Internet connectivity many times in the FOA Newsletter, mostly with Google Fiber cities and the wild idea of using balloons in the stratosphere for wireless. But now Facebook is getting involved too, creating a a coalition (and website "Internet.org") with Ericsson, MediaTek, Nokia, Opera, Qualcomm and Samsung — to develop joint projects, share knowledge, and mobilize industry and governments to bring the world online. Partners will collaborate to develop and adopt technologies that make mobile connectivity more affordable and decrease the cost of delivering data to people worldwide. 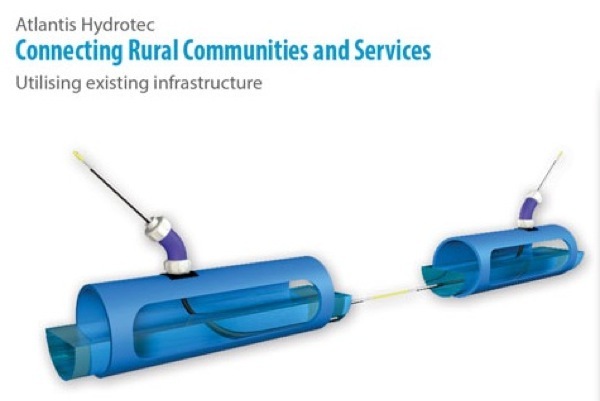 Potential projects include collaborations to develop lower-cost, higher-quality smartphones and partnerships to more broadly deploy internet access in under-served communities. One of those projects combines solar-powered drones, low Earth orbit satellites and lasers to provide low cost Internet connections to under-served areas. We don't think this is an April Fool's joke like Google TISP (see above) and it's certainly no more far-fetched than Google's balloons, and anyway, a few years ago, who would have believed that Google would build FTTH in many cities. Technology works that way! FOA recently attended a conference on what is called "4D" run by DAQRI, a company that is involved in "augmented reality." What is 4D or "augmented reality?" It's lots of things, probably best understood by illustration, but think of using a tablet computer , holding it over a real object and seeing specific data on the object like specifications or directions on how to use or fix it. Yes, the software can be programmed to identify an object and then bring up the correct information. The technique has been used for entertainment and art as well as training, but since many of the training applications have been developed for people who do not want their secret applications revealed, you have to use some imagination. Our imagination was working overtime - think about using this to teach fiber optic termination, splicing or testing, especially troubleshooting. We suggest you look at their website, read the explanation of augmented reality and see the examples in their portfolio. The head of the US Federal Communications Commission (FCC) is calling on US lawmakers to change the way internet connectivity is funded and deployed in schools. Speaking at a legislative conference, Tom Wheeler – chairman of the watchdog – said the E-Rate program that supplies communications gear to schools and libraries in America should focus on replacing wired Ethernet in classrooms with Wi-Fi setups. "So for the most recent funding year America’s largest program for connecting schools spent less than half of its $2.4 billion providing 100 megabit-per-second capacity, and nothing for Wi-Fi. Why do we spend over a billion dollars per year on things that don’t enhance the high-speed broadband connectivity our teachers and students need? For some reason, this showed up in a UK website! Available for sale, Southern Nevada Electrical Underground Utility Company, In business for many years, Turn key operation, Super equipped outfit, several aspects of installs, Strong sales and heavy back log, $4m or better. 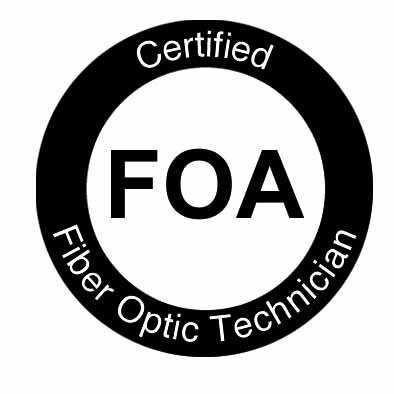 Two years ago (2012), we ran monthly tutorials in the FOA Newsletter on OTDRs, hoping to teach a few more techs how to use these complicated devices and reduce the number of problems created by their misuse. But OTDRs still are the largest source of user problems and the calls to the FOA for help! In just one week, we received calls on two problems that turned out to be the same exact issue. The tech connected the OTDR with a launch cable, hit the autotest button and, well, you can guess the rest. Fortunately, we know a little about the test to make it easier to understand. The OTDR was set up with a ~500 foot launch cable (distances are in feet, 500 feet = ~152m) and the cable under test has fairly long pigtails spliced into an underground cable with mechanical splices which were suspected of having failed in the brutal cold of this last winter. But the traces show little useful information. The connector reflectance overloads the OTDR and makes finding close objects impossible. You get big confusing ghosts at twice the length of the launch cable. Here's why - for some reason, the autotest setup chose a pulse width of 100ns even on this short cable setup. The contract required OTDR testing from one end only. No launch or tail cord was required. 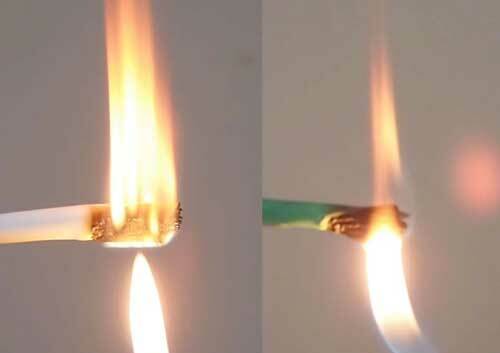 A launch cable was used however. 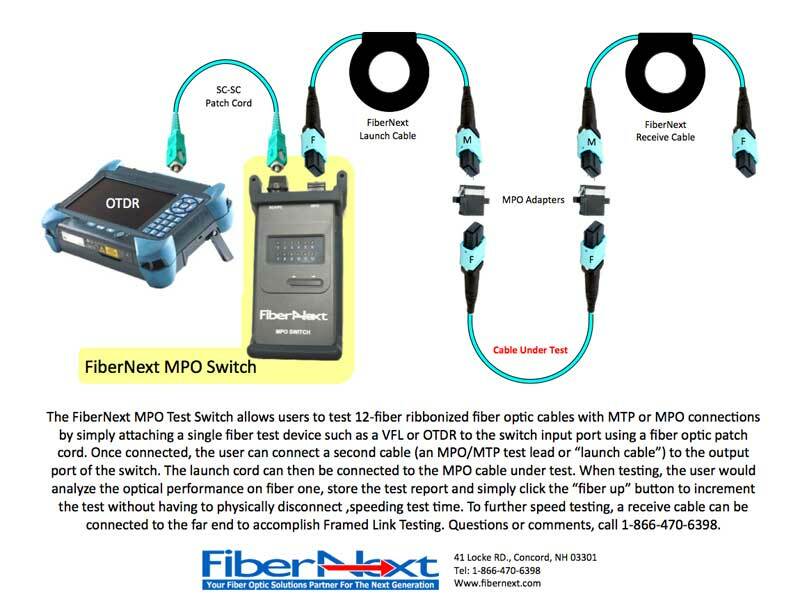 The OTDR was in auto mode for the first couple of traces and the contractor was told by the test set manufacturer that the software would set all the correct parameters for the fiber under test. The use of auto mode at 100 ns and expert mode at 1000 ns were both inappropriate. The range settings were mostly inappropriate. After submitting the traces to the OTDR manufacturer, they were told there was a glitch in the software. OTDR set up parameters suggested for testing ---- cable system. If possible, select a range approximately one and a half (1 ½) times to two (2) times longer than the fiber to be tested. 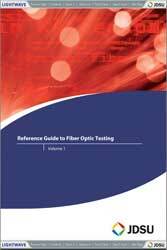 Example: fiber on records indicate 1200 meters; select at least 1800 meters but not more than 2400 meters. Select 10ns pulse width for any trace with less than 5 dB total loss. This total loss would include a launch cord if used and all in line connectors. Based on the length and calculated expected loss 100ns should not be needed. Average trace until the trace of backscatter from the fiber at the far end is relatively straight with low noise. A minute or two, maybe more. The A cursor should be presicisly placed immediately before the connection of the launch reel to the cable under test, but not on any rise of that Fresnel (rise/spike) generated by the launch reel to the fiber under test connection. Now do you see why we say "don't use autotest unless you know what you are doing and have checked the trace setup manually first"! 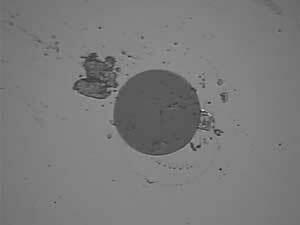 The problem was the recovery from the reflectance overload at the connection between the launch cable and the cable under test was not recovering quickly, so there was not enough usable fiber trace to get a valid reading of the slope of the fiber which is the attenuation coefficient. 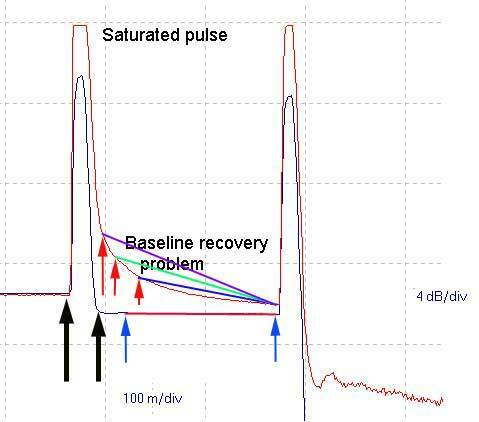 When the marker is placed on the tail of the recovery pulse (the red arrows), the slope of the measured trace is much higher than the actual slope of just the fiber attenuation, leading to values that cause the fiber to fail testing even if it is good. To get a valid reading the pulse must fully recover to the baseline of the fiber as shown by the black arrows and then the markers can be placed as shown in the blue arrows to make a fiber attenuation coefficient measurement. 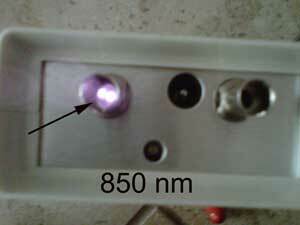 But to make this measurement, the fiber must be long enough and the OTDR resolution high enough. Last September in the FOA Newsletter, we told you about the Intel "silicon photonics tehnology" and a promised product for data centers. According to the CIO Website (CIO = Chied Information Officer), U.S. Conec is now shipping MXC parts, paving the way for distributors to sell cables to server makers and data center companies. Corning, Tyco Electronics and Molex will sell MXC cables perhaps as soon as later this year. MXC uses multimode fiber and a cable can have up to 64 fibers, with each fiber transferring data at 25Gbps. The fastest cable that can transfer data at 1.6Tbps (that's "marketing speak" - if one assumes 32 fibers in each direction, it's 800Gb/s full duplex) will have 64 fibers. 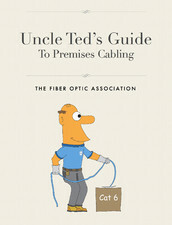 The pricing will depend on the number of fibers in a cable and the distance. 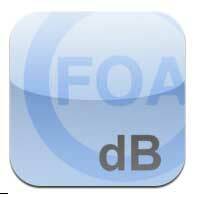 For technical details see the September 2013 FOA Newsletter. Meanwhile, over at IBM, they have their own silicon photonics projects, but according to Lightwave reports from the OFC show this month, IBM is using the technology to develop links using CWDM for 4-8 channels of 25 Gb/s over duplex singlemode fiber good for over 500m links. IBM is also targeting data centers for its products. 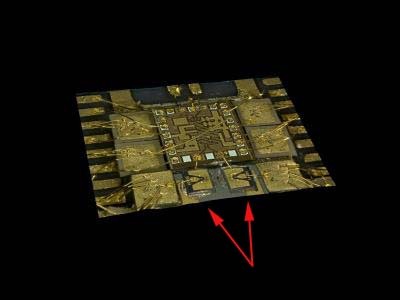 IBM offers this graphic (below) which is either a highly complex integrated circuit chip or an apartment building from the movie TRON. And this is not the only technology IBM is exploring - read the story below this one. 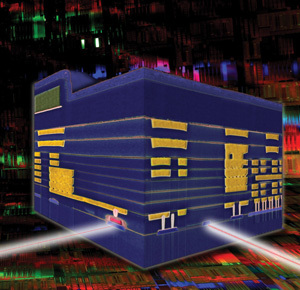 Is this an IBM integrated circuit or a building from TRON? All this activity in silicon photonics (read the overview by Stephen Hardy of Lightwave here) is being led by giant companies with big R&D budgets and lots of clout in the marketplace. But will all their efforts actually lead to viable (both technically and economically) products? Both the Intel and IBM links use external modulators on the lasers - that's the focus of their silicon photonics. But researchers at Vanderbilt University, University of Alabama-Birmingham and Los Alamos National Laboratory have used nanotechnology to create optical switches that operate at terabits/second. That's ~1000 times faster than the Intel and IBM links. 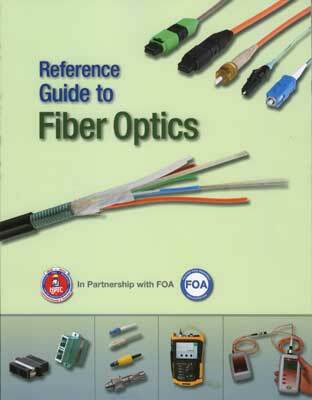 The devices use some innovative technology that offers promise for fiber optics. Here is the article about them. Using hybrid silicon photonics, researchers at CalTech hav produced lasers with much narrower line widths that offer tighter spacing for DWDM. Like the other R&D projects, the question is commercial feasibility. Abstract of announcement. Demonstrating that multimode fiber is not quite dead yet, researchers at IBM have set a new record for data transmission over a multimode optical fiber. The achievement demonstrated that the standard, existing technology for sending data over short distances might be able to meet the growing needs of servers, data centers and supercomputers for a while longer. 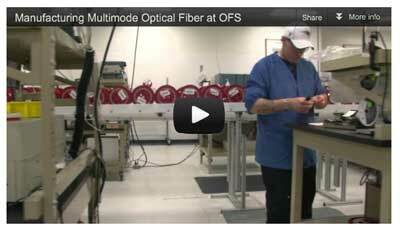 But the demonstration also shows how limited multimode fiber is. The demonstration was only capable of sending data at a rate of 64 gigabits per second (Gb/s) over a cable 57 meters long using a special vertical-cavity surface-emitting laser (VCSEL) and receiver chip, a rate that was about 14 percent faster than the previous record and about 2.5 times faster than the capabilities of today's typical commercial technology. Actually it’s more like 6 times the 10Gb/s max used in today’s multimode systems but they can operate up to 300m. 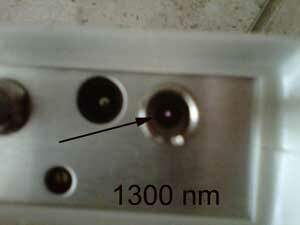 The researchers used VCSEL lasers developed at Chalmers University of Technology in Sweden (see arrows above) and custom silicon-germanium chips developed at IBM Research. "The receiver chip is a unique design that simultaneously achieves speeds and sensitivities well beyond today's commercial offerings," Kuchta explained. "The driver chip incorporates transmit equalization, which widens the bandwidth of the optical link. While this method has been widely used in electrical communication, it hasn't yet caught on in optical communication," he said. Equalization is widely used in electrical communications circuits to compensate for the frequency response of the circuit or copper cables. 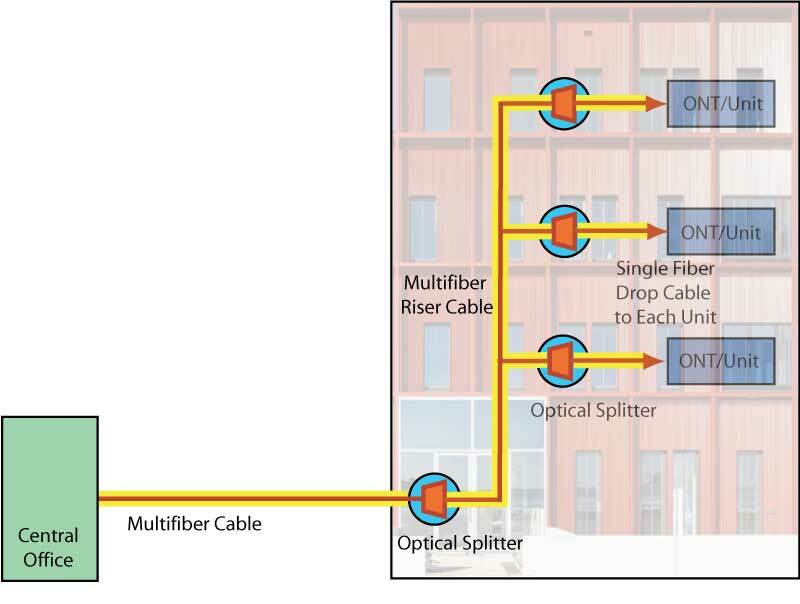 Most high speed fiber links do not require it, especially those using singlemode fiber, but the much lower bandwidth capacity of multimode fiber has been its limitation. It will be interesting to see if this gets commercialized. At the recent IEEE 802.3 meeting, there was little interest in developing a 25Gb version of Ethernet. While work continues on a 4X25 version of 100GbE, companies at the committee meeting showed little interest in another standard, even if it was simply one of the 45 Gb lanes of the faster standard. This shows what many are discovering in the marketplace - that users want faster links but in big steps, not little ones, which are easier for manufacturers but offer little cost advantage to users. There is a notification from UL that this communications cable bears a counterfeit UL Mark for the United States and may pose a hazard. 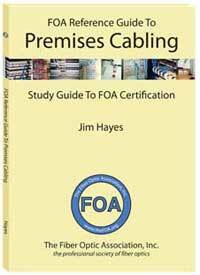 The communications cable has not been evaluated by UL to the appropriate Standard for Safety, and is not authorized to bear the UL Mark or any reference to UL. This cable is known to be sold at NewEgg (http://www.newegg.com/) and may have been sold at other locations. Here are more details from the UL announcement. Thank you for the testing results. I've been to all the termination sites and have to say I am extremely impressed with your work. The fiber boxes are as they should be. You've straightened out preexisting (former contractors') sloppy work, verified all terminations were within spec and provided consistent and comprehensive reports and feedback. It's a real pleasure to work with an adamant professional and it reflects in your work. FOA is always proud of its members and really enjoys feedback like this. Mike also sent us an interesting photo of one of his students. 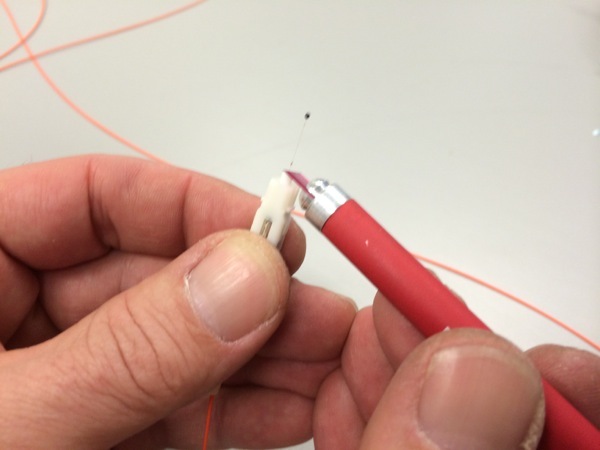 The point is that the angle of the scribe being used to cleave the fiber at the connector ferrule end needs to be appropriate for the scribe used. Some scribes, like this one, have flat blades while others are round and thicker. 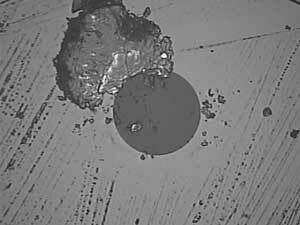 The fiber needs to be cleaved just a millimeter or so above the end of the ferrule, so the angle of the scribe is critical. 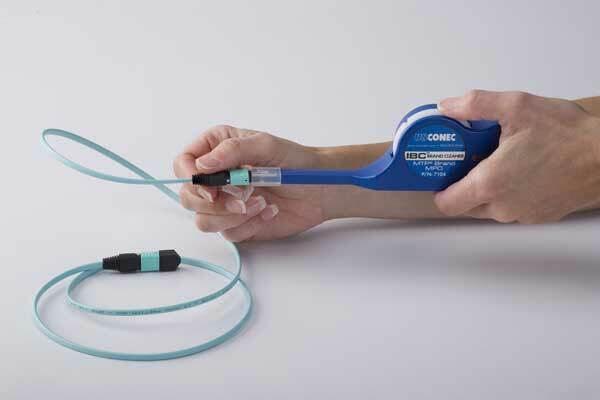 You also need to do this gently and precisely to prevent breaking the fiber, so holding the connector and scribe like this, with the fingers from each hand touching, can help steady the hands to work more precisely. 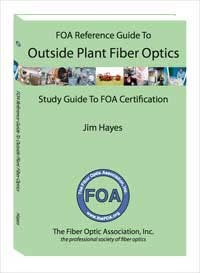 The page on Optical LANs (OLANs) has been expanded to 5 pages with new material and links - and a Fiber U self-study program. 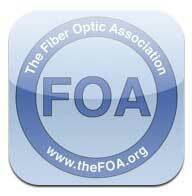 FREE Webconference hosted by the TIA's Fiber Optics LAN Section! Standards are quite literally the backbone of the structured cabling industry. Understanding how standards have evolved, and how they impact your business, is critical. Here's your chance to stay current with evolving requirements and ask questions that you might have on how to interpret them for your network. This webinar will summarize activities in TR-42 and IEEE task forces. Join EXFO's experts for this seminar that will use a combination of theory and practice to explore the best testing practices and methods for detecting issues during the construction and turn-up phases. Topics for discussion include how to be more effective in the field by making better, more informed decisions. The concepts taught during this session cover the physical and service transport layers, and primarily apply to distributed antenna systems (DAS) and fiber-to-the-antenna (FTTA) deployments, but can also be applied to most short-distance fiber deployments. Seminars are being held in locations around the US. April seminars are in NJ, NV and IL. Register here. 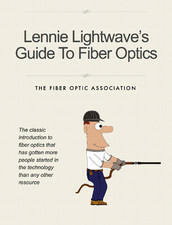 Networks - we mostly focus on cabling but need to understand the networks that use it! Q: I have been asked internally what I would do and how I would start a data division. I know from looking at your website that you understand it and I was hoping you could give me some bullet points on how I would get a Tele/Data division started up from its infant stages. Any advice you could give me would be appreciated. A: Basically, the cabling installation is similar to electrical, just the termination and splicing are different and testing is specialized. All these are easily learned. 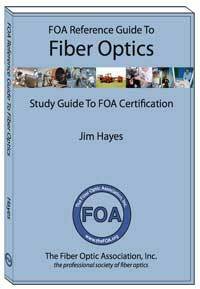 FOA has Fiber U free online training in both fiber and structured cabling (fiberu.org) and 80 YouTube Videos on this subject (FOA channel "thefoainc" you can use to become more familiar with the topics. 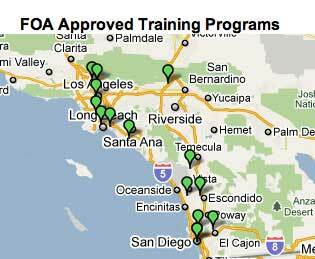 Through the FOA we have approved schools that offer training and certification, courses you can take at scheduled locations or have brought to your facility. Q: I read on your website information about ODTR, and I'm curios if you could offer some more information. I am interested in all compatible standards considering OTDR Calibration. So far I managed to find out that there is IEC 61746-1 standard for Calibration, and also TIA/EIA-455-226 wich is adoption of IEC 61746-1. And I concluded that those 2 are surely internationally approved and do the same thing. I found in some website the offer for calibration performing both NIST traceable, and TIA 455. I could not find out what is relation between TIA and NIST traceable calibration standards ( if there are any), is it the same or those 2 are compatible (if u use one of those for OTDR calibration it is enough)or those 2 are different and you need to perform both. Other than the IEC document, I know of no other standards or traceable calibration by a national standards lab. Small cells are becoming very important for cellular coverage. Read this JDSU report published by Lightwave. At the recent FTTH Council meeting in Lafayette, Louisiana, we talked to Tim Barron, a consultant working with Network Design Decisions, Inc. (NDDI), a subsidiary of the global IT company Velankani Communications Technologies. 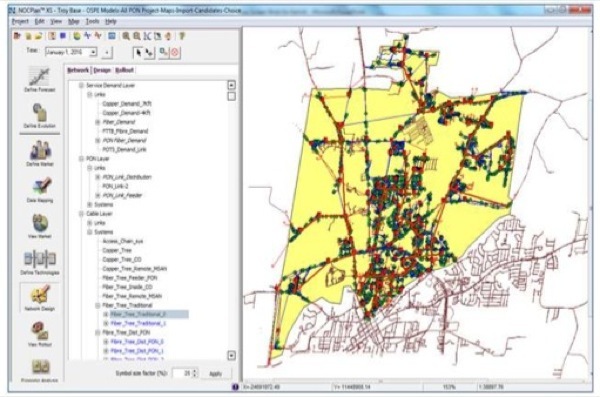 NDDI provides a unique FTTx software capital planning tool called NOCPlan that allows the user to design, scope, and cost-out a new neighborhood or city-wide fiber project. It identifies demand points, optimizes where the OLTs, splitters, and fiber should be installed, generates a Bill of Material (BOM) and produces a total project cost for equipment and fiber construction. 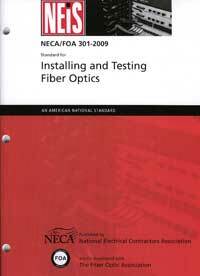 If you are designing a FTTH system, NOCplan might be worth consideration.